Tazo Zen Tea is made from Chinese panfried green teas blended with mint and lemon grass. 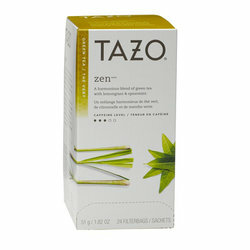 Tazo Zen is a blend of exotic green teas, lemon verbena, spearmint and natural flavors. It takes off from plain green tea and adds a zesty, minty, fruity quality that is quite nice, subtle, yet definitely there- soothing for a sore throat, very cooling iced on a hot day.24 bags in a box.